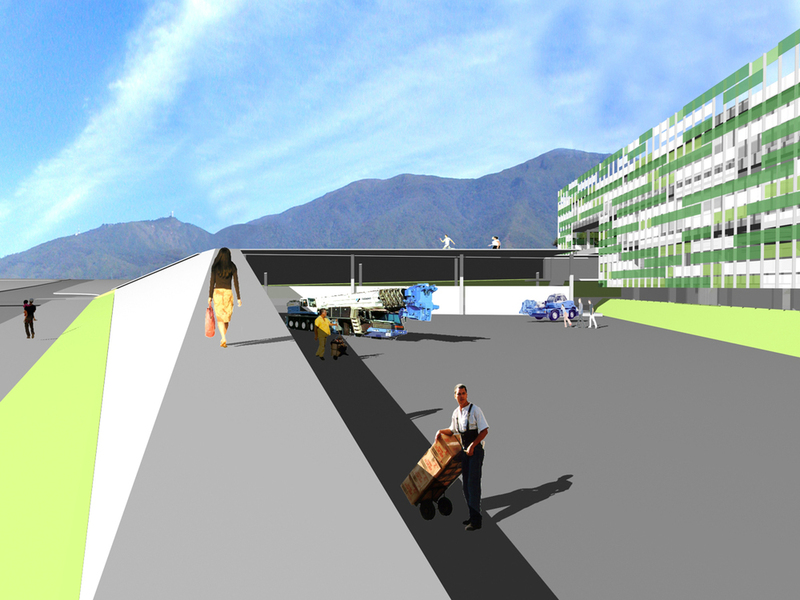 The placement of a large service center within a major setting in Caracas, for the operation of one of the nation’s basic companies, was an attractive challenge. On one hand, Electricidad de Caracas (Caracas Electricity) desired a comfortable and efficient place to operate. In addition, and very importantly, the city should benefit from this new presence, whether viewed by someone approaching it on foot, or by someone seeing it from a vehicle moving rapidly along the highway or more slowly on nearby streets. 1. Create a new urban landscape that incorporates the required activities and at the same time allows the creation of an active, agile, efficient and attractive contemporary environment. 2. 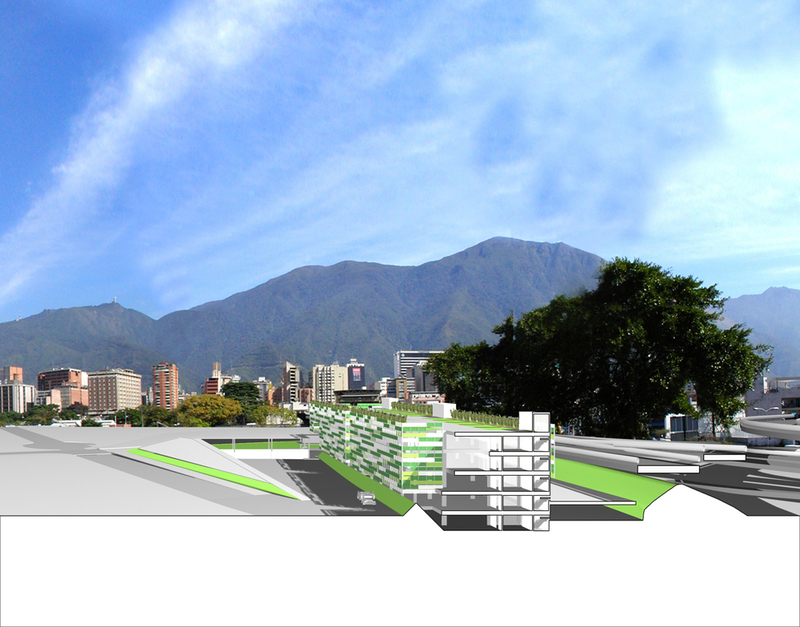 Consider within the proposal the nature of the unique surrounding landscape of elevated highways and slopes, so typical of Caracas, to create a modern, intriguing and dynamic place appropriate to the 21st century. 3. Clearly differentiate the functions within the service center, so that the diverse activities it houses can enjoy autonomy as well as the necessary linkages. 4. Design a building protected from the sun, adjusted to our climate, which will also allow air circulation and a crystal-clear view through the proposed insulating and dense skin. 5. Create comfortable and efficient but contained service areas to guarantee the safety of materials and equipment. 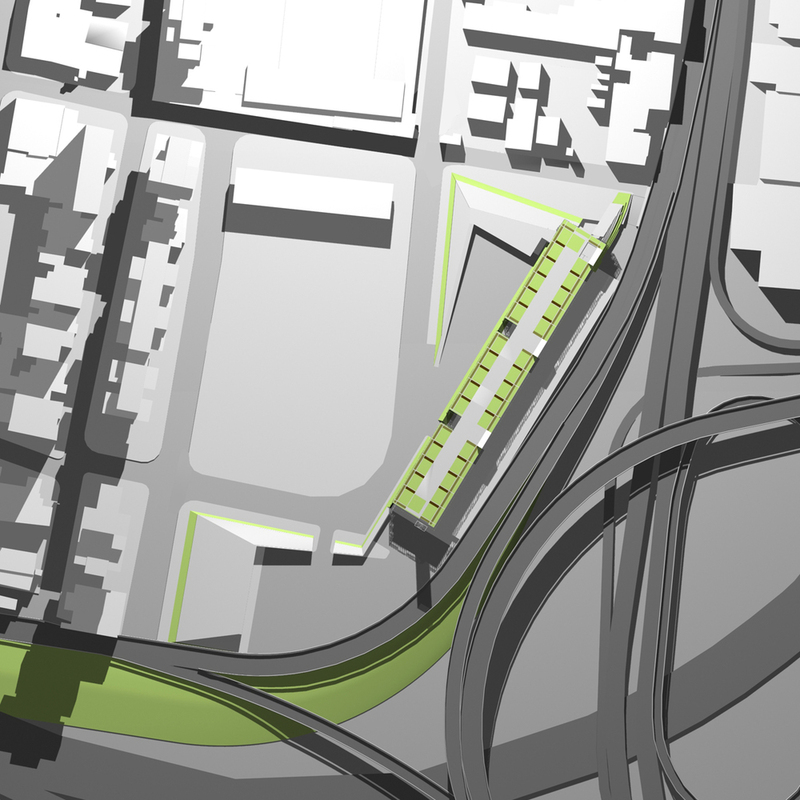 This containment also aims to create an attractive surrounding on the outside, through partially natural slopes with grass a meter high, that continue thanks to the inclined roofs with the same slope as storage and other service areas. 6. Present an ecologically responsible proposal with favorable results not only for the city of Caracas but also for the company’s prestige at the metropolitan level. The architectural design was based on the creation of three basic elements: a large prism, a system of slopes and a set of patios. 1. The great elevated prism with intriguing colors and a plant-filled appearance and nature thanks to the raised gardens, has a novel surface, broken up into color fragments as though it were an immense painting; it also seems to float above the complex’s landscape of patios and slopes. 2. The set of slopes and inclined surfaces that make up the roofs,primarily over the storage and services area, at the same time confine the company’s areas for maneuvers and operations and creates some privacy for these activities while forming an interesting combined landscape. The combined operations patios, uncovered warehouse and parking, which are connected to the complex’s two major entrances, are contained thanks to the large inclined roofs of the warehouses and the grass slopes with which they are in close contact. 3. The project’s three basic elements are mutually involved so as to generate a friendly work environment that is achieved with the architecture and the terrain’s own resources. A place for heavy work, administrative activities and storage, that is not at odds with the possibility of aesthetic achievements that benefit staff efficiency and pride in the workplace.